Can you tell us about Snowflake Software? Snowflake Software is the award-winning provider of cloud and on-premise aviation data management solutions to ANSP and Airline customers. Our vision is to accelerate innovation in the Aviation industry by making the world’s aviation data accessible and easy to use. We’re passionate about being a part of SWIM implementation and compliance throughout the industry, especially with the ICAO Aviation System Block Upgrade framework coming into play in the next few years. We’re a fast growing business with offices in the UK and US and we will be opening an office in the Abu Dhabi, UAE (late 2017). Tell us more about your product? applications. The end-to-end data management platform is dedicated to fusing, cleaning and organizing the world’s aviation data to unlock its full potential. Managing multiple data feeds in a single system makes it easier to build valuable, operational applications and achieve SWIM implementation. What kind of work does Snowflake do for its customers? Most recently Snowflake has been selected by the General Civil Aviation Authority in the UAE to develop the SWIM Gateway, which we’re extremely excited about. In other regions, we worked with NATS on the Cross Border Arrival Management (X-MAN) project for Heathrow airport, where we won the IHS Jane’s ATC Enabling Technology Award. As a result, X-MAN has managed to save over 4,700 tonnes of fuel and 35,000 tonnes of CO2, resulting in over $5 million in savings since 2014. We also won the IHS Jane’s ATC Award for Innovation in 2016 for our work with the IATA/Harris SkyFusion project where the Laminar Data Platform provides data fusion, transformation services, and generation of a Globally Unique Flight Identifier (GUFI) for data from multiple commercial and ANSP sources. What is the SWIM Gateway and how is Snowflake involved? 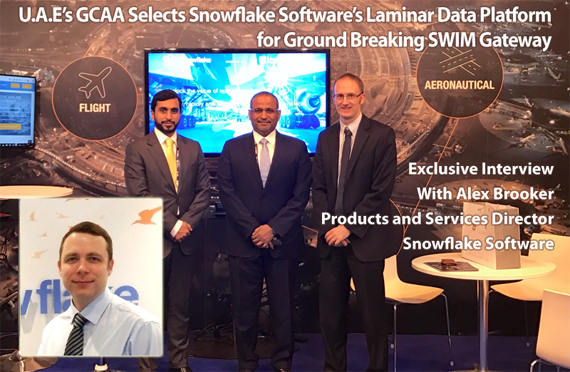 The SWIM Gateway will utilize the Laminar Data Platform to manage flight data in compliance with the System Wide Information Management (SWIM) concept for GCAA. It will receive, validate and publish the most up-to-date flight planning and strategic tactical flow management data, which will provide a platform for information exchange amongst all stakeholders in the region. Deploying the Laminar Data Platform for the SWIM Gateway has enabled an open modular architecture. This supports advanced configuration of additional business logic as an enabler for a next generation Air Traffic Management (ATM) System including Globally Interoperable Systems and Data – Flight and Flow Information for Collaborative Environment (FF-ICE, ICAO ASBU B2-25). How is this project going to benefit the region? The SWIM Gateway will provide the Sheikh Zayed Air Navigation Centre with consolidated information for all planned and active flights in the UAE. Detailed information, such as estimated landing times and controlled take-off times will be made accessible to all stakeholders including airline operators and airports. Stakeholders will be able to receive high quality flight information in real-time through open interfaces with their decision making applications and to share information back, after the data is validated by the platform. We at Snowflake are very excited about the promise of the SWIM Gateway and how it will transform the collaborative decision making processes in the region. What are your plans for the UAE region? We are dedicated to achieving a single, unified and global view of aeronautical, weather and flight data across airlines, airports and ANSPs. Alongside our continued growth in Europe and North America we look forward to working with GCAA and other connected aviation stakeholders to put the UAE region at the forefront of SWIM compliance and collaborative decision-making within the industry. To spearhead efforts and work more closely with our customers in the region we’ve appointed Rizal Pickard, Business Development Manager - Middle East and our Abu Dhabi office will be opening its doors later in 2017.